Yes we host several of our client websites. We lease several servers for just this reason. Our servers reside in two of the top data centers in the world with multi-redundant power and connectivity. The data centers are connected by the industry’s most advanced network within a network, which integrates distinct public, private, and internal management networks to deliver lower total networking costs, better access, and higher speed. 2Tbps between locations. Less than 40ms of latency into the private network from locations around the world. We provide an easy to use domain control panel for adding email accounts or password protecting directories, creating a database, as well as other domain functions. If you would rather not worry about working with the control panel we are always here to make those changes for you at no additional cost. Just let us know what you need. Can I use another host? Yes. If you have hosting we can work within that environment providing your host is offering the features needed for your site. We deploy new sites as well as work on existing sites hosted by other companies. Can you register a domain name for us? Yes, we will register your domain name using your company or professional name and contact. This will show proper ownership in the whois database. Although you will have access to the domain name control panel we generally handle any changes that need to be made here for you, such as inputting the correct name servers. You can check domain name availability here. Can I see my website while it’s being developed? Of course! Please view our work flow information to understand your involvement here. The time to complete a fully functional website varies and is based on several factors. Generaly custom work can take anywhere from 1 - 4 weeks, depending on the complexity of the design and the number of revisions you require. Apart from the size and scope of the site, the length of time is most often affected by the amount of graphic design and any additional input such as product inventory or content writing you might require. We will make every effort to meet the timeframe you have in mind. We can't give you a hard price until we evaluate your needs. Whenever possible we will look for ways to save you money and pride ourselves on affordable rates. To get a better idea of the cost of what you want to build, submit this form. Explain your online goals, the nature of the site, the sort of interactivity the site will have, your graphic design needs, etc. We will then offer several price options. Depending on the features you want for your web site, the cost can be anywhere from a few hundred dollars to a few thousand. It is difficult to quote an average price, due to the enormous range in requirements for a site. A basic simple site will run in the $400 to $600, while a full custom design will come in closer to $800 - $1500. Other authoritative sources generally quote in the $1,000 - $2,000 range. 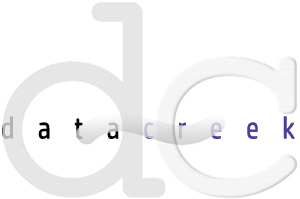 Remember, a consultation with datacreek is always free and we feel sure we can save you money. Get started here. You have several opportunities to make changes during the development process. After you've agreed on the general format and color schemes of your design, we'll complete up to 2 rounds of major revisions at no charge. All minor revisions are provided at no charge. A 50% deposit of the estimated fee must be provided prior to beginning work, with the remaining payment due upon completion of the project. For larger projects, an initial payment representing one-third of the estimated total fee is required. The second payment is required upon the halfway point, with the final third due upon completion of the project. Completion of projects are defined as when the site is live.